The most recent project to arrive on my desk came from a commercial real estate agent. He finds that many of his clients have trouble visualising what a property would look like with their business and brand occupying the space. My job usually entails taking a particular site or building and giving it a digital fit-out using tools like Trimble Sketchup and Google Earth to render some static images or videos that can be shown to a prospective tenant. I also have a background in town planning, so I can make sure that the digital redevelopment of the site actually meets the council’s planning and development standards. Sometimes I am tasked with giving an existing building a makeover. Those are fairly straight forward, as Sketchup has features that enable a building to be digitized from a perspective photograph of the existing buildings on the site. After modelling the existing building, all you then need to do is swap out the cladding and glazing for one that fits with the client’s tastes. Other times I am dealing with a vacant site, so the Google 3D Warehouse becomes the go to place to find ‘stock’ models that fit the client’s specifications. In this case the client was a nation-wide business that has premises all around the country. They provided me with plans and elevations for one of their recent builds, so it was a straightforward exercise to construct a 3D model of the plans. So far, so good. This step was also fairly straight forward. Bang the property address into Google Maps, and there it is. Well not exactly. That’s where the site generally is (the location of the point address) but it does not show the location of the legal property boundaries. For that I had a couple of options. I could have gone to the ultimate source of the truth for property data in New Zealand (Land Information NZ), which has a great spatial data service. In this case I needed the local council zoning information, so I chose to use Whangarei District Council’s web service instead. From the GIS web service I could search by site address, which takes me to the correct site complete with parcel boundaries highlighted. A handy feature of this GIS site is the ability to download a copy of the map (complete with scale bar), which is what I needed to digitise the site into Sketchup. This also allowed me to see the boundaries of the adjoining properties, which were colour-coded by their zoning — super handy! Bang that map into Sketchup and rescale to 1:1 using the scale bar, and then on to Step 3: annotating the land development controls. 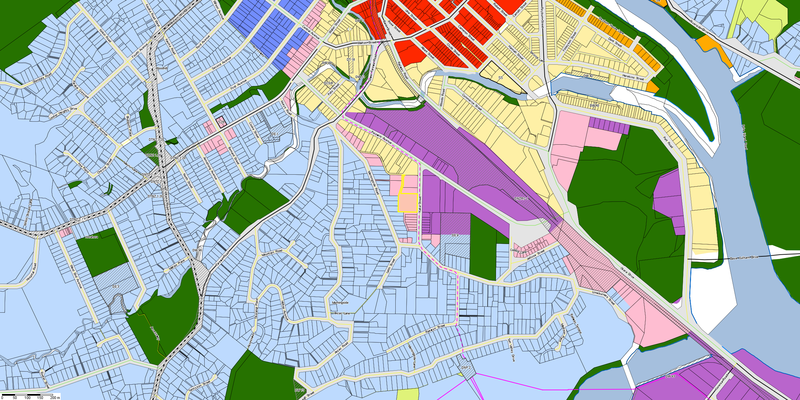 The district planning maps show the site as being zoned Business 3. I turn to the rules for that zone by going to the table of contents and clicking on the relevant chapter. It promptly downloads a pdf version of the rules. Not an uncommon format, but not ideal either. So let’s jump straight in to see what the rules are. Prohibited activities are the most restricted things that can be done under the Resource Management Act 1991. By that I mean they can’t be done. At all. You can’t even ask for permission. I figured that the client is unlikely to be keeping radioactive materials on site, so spared myself having to work out how to measure 1000 terabequerels. Permitted activities under the Resource Management Act do not require any planning approval (resource consent) at all, so ideally you’d want to fit within those rules. The site I’m looking at is right next door to a residential zone so there are some limits around operating hours. The nested rule takes some deciphering, but it basically says if you’re within 50m of the boundary, you can’t operate between 10pm and 6am. By drawing a 50m buffer from the common boundary, I am able to map the extent of land affected by this rule. Next up are the requirements for car parking. If you wish to have parking on site the standard of construction is set out elsewhere in the planning rules and engineering guidelines. For the purposes of my model, I needed to make sure that there are no car parks within 2m of the road boundary. This is simple enough to illustrate by buffering the road boundary by 2m. Be careful if there is any plan to fence the boundary though, because any fences with that 2m buffer area are limited to a maximum height of 2m. So many things to cross check against! Ugh. Once again it is possible to map this requirement by adding a 2m height limit along property boundaries. Although, there are extra things to think about when there is a residential zone next door, as was the case here. If you wish to store things outdoors, then they need to be screened from residential neighbours, so make sure you don’t stack things higher than 2m. By now you will be noticing a pattern. Combinations of cryptic rules nested into tables are terribly difficult to follow. I’ll spare you the other dozen or so rules that I had to work my way through, but I will show you the clincher. Step 4: Are you kidding me? The next part starts off fairly well. It’s the ‘building rule table’, which sets out the nitty gritty rules about where on a site you can build. It’s what I needed to know so that my model was placed in a way that does not trigger any planning consent requirements. 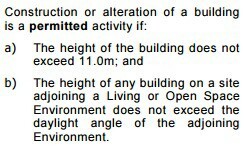 Maximum height of buildings is 11m. No problem. I simply selected the ground layer in Sketchup, elevate a copy of it by 11m, and then highlighted and coloured it semi-transparent. It was the second part of that rule that became a bit more challenging. The site adjoins a residential zone so the ‘daylight angle’ of the adjoining Living 1 Environment (residential zone) needed to be complied with. So what does the daylight angle rule say? Well here is the rule, which largely repeats the previous rule and then directs you to an entirely different part of the rule book. It’s at this point that you would wish that you’d paid more attention during your trigonometry class. 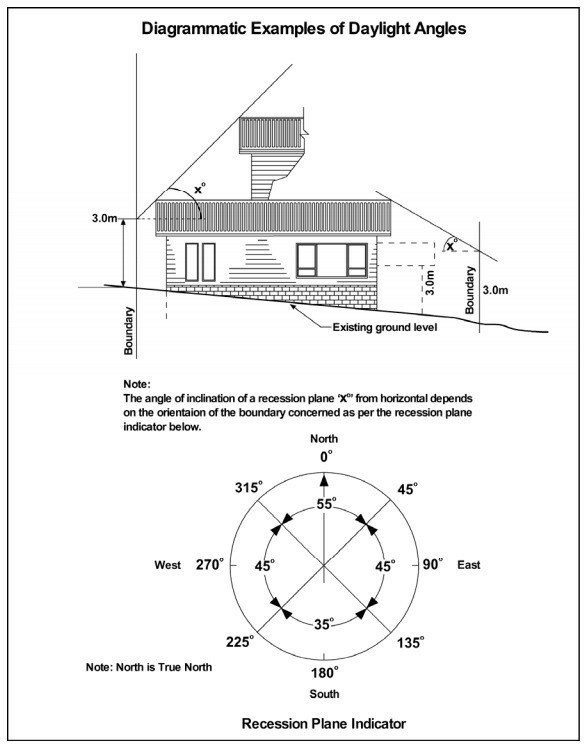 District Plan Appendix 11 — Diagrammatic examples of daylight angles. I’ve been working with rules like this for years, and I still find this confusing. Describing requirements in this way is what keeps council processes out of reach of the general public. On days when I’m feeling particularly skeptical, I suspect that some within the industry want to keep it a dark art. Who knows. I would prefer that people understand council rules so that they can make informed decisions on their own, without having to consult a property professional at great cost. So how could it be done better? Maybe use a bit of off-the-shelf software that actually shows things in 3D. It’s 2016, people. We have the technology. Let’s start using it. Animated explanation of the daylight angle and building height controls.